From Dublin to London, discover the best of Britannia with a journey encompassing history and tradition. 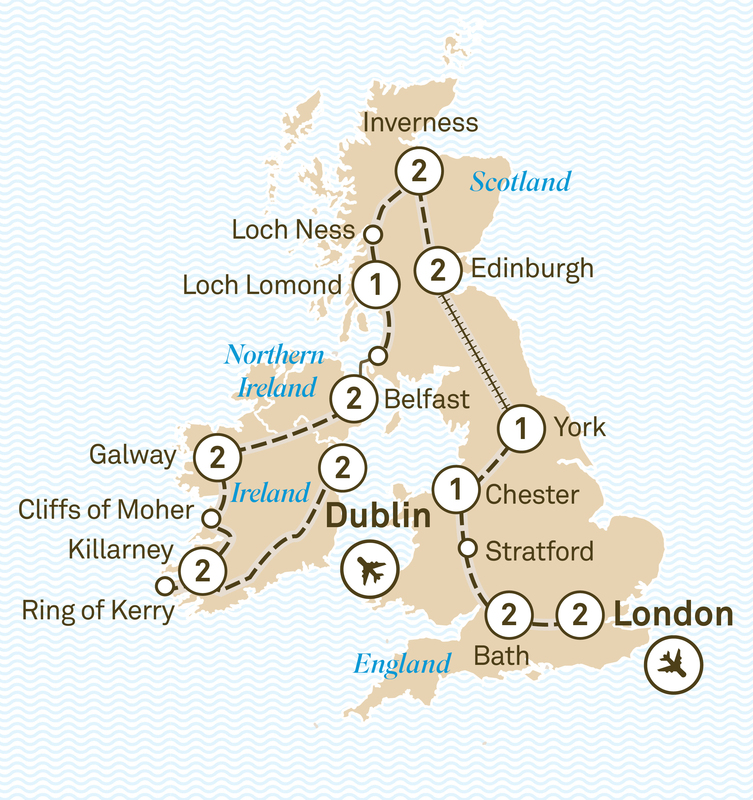 Highlights include Dublin, Edinburgh & Stonehenge. Start your journey with two nights at an historic hotel in Dublin. Tour Trinity College and access the Long Room and famous Book of Kells, or explore the Guinness Storehouse. Tonight, visit an Irish pub for dinner, and be immersed in the local music and culture. Discover Blarney Castle before continuing to Killarney for a two night stay. Enjoy a ride in a Jaunting car, a traditional horse and carriage, or visit historic Muckross House. Explore Bunratty Folk Park, before driving along the spectacular coastline to the Cliffs of Moher. Arrive in Galway for a two night stay. The city of Galway is lively and full of colour. Today explore the city during a guided tour. En-route to Northern Ireland visit the Monastery of Clonmacnoise. Walk among the ruins and learn the history of this spectacular site. This afternoon arrive in Belfast for a two night stay. Belfast is a port city with a fascinating history. Learn about its troubled past during your guided tour. Discover the story of the Titanic, from its design and build to its fateful ending or ride in one of Belfast’s historic Black cabs and learn further about the cities past and present. This morning journey to Scotland via ferry before continuing on to Loch Lomond, renowned for its splendid natural beauty. Enjoy an overnight stay. Journey to mysterious Loch Ness and visit the ruins of Urquhart Castle, then head to Inverness for a stay. Discover Cawdor Castle and learn the importance of the ‘wee dram’ to the local economy, before visiting a traditional cooperage. Tour the historic Glenfiddich Distillery and sample one of the most celebrated whiskies in Scotland. Upon arrival in Edinburgh, check into your hotel for the next two nights. This evening enjoy a guided tour of one of the regions most iconic castles, where you’ll enjoy a glass of champagne. During a city tour board the Royal Yacht Britannia and explore Edinburgh Castle, the iconic symbol of this beautiful 1,000 year-old city. Journey to York by train to learn about the city’s Roman and Viking heritage on a guided tour. Overnight stay in York. Today visit Chester, one of Britain’s best preserved walled cities. Join a guided walking tour, including a visit to it’s famous Cathedral, before arriving at your iconic hotel. En-route to the Roman city of Bath visit Stratford, the birthplace of Shakespeare. See the most popular sights of the town including the famous Bard’s house. Discover Bath on a walking tour then visit the Roman Baths, constructed in 70AD. Discover mythical Stonehenge, then continue to Salisbury and visit its majestic cathedral. Your final destination today is London, where you will enjoy a two night stay at your historic hotel. This evening enjoy a delicious farewell dinner at one of London’s most historic pubs. After breakfast, transfer to London airport for your homebound flight, taking many wonderful memories with you.